This article first appeared in the June 2013 issue of hi-end hifi magazine fairaudio.de of Germany. You can also read this factory tour of Mundorf in its original German version. We publish its English translation in a mutual syndication arrangement with the publishers. As is customary for our own articles, the writer's signature at review's end shows an e-mail address should you have questions or wish to send feedback. All images contained in this review are the property of fairaudio - Ed. 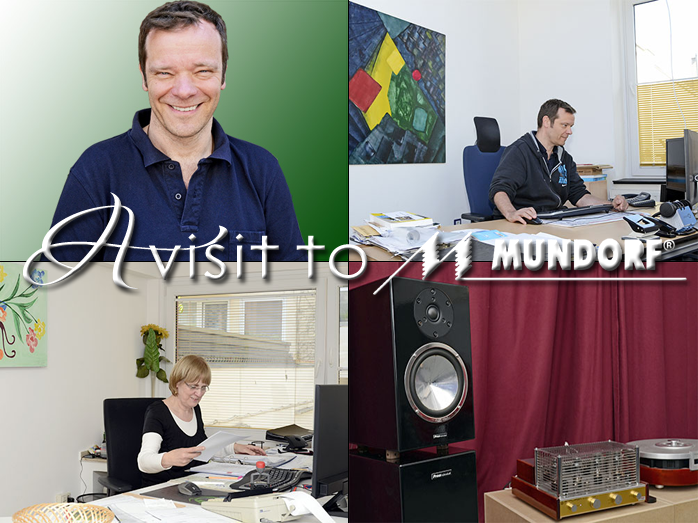 1: Raimund Mundorf of Mundorf EB GmBH has reason to smile | 2. The owner and chief developer at work | 3. Angelica Filke is in charge of procuring, personnel and finances | 4: Mundorf even accommodates exotic auditions. Mundorf. After reading just three hifi reviews, most will recognize the name. What maker of hifi parts is better known than that? Particularly with speaker crossovers the brand has become nearly omnipresent. Perhaps this perception is somewhat Germanic in that reviewers like to review domestic products and readers remember them better? Maybe. For sure 'Made in Germany' factors big with Mundorf. Employing 25 people, 24 of them work out of Köln and only one in China. That's Norbert Mundorf. But rather than oversee production, he manages Asian distribution. The Far East presently accounts for nearly a quarter of the firm's turnover and as such for only slightly less than their domestic sales. We thus didn't traipse to China but the Rhine region to chat with Raimund Mundorf, owner, operator and chief engineer of the company and Norbert's younger brother. Our talk didn't just cover coils and caps, cables and air-motion transformers but also the history of this family enterprise from Cologne. Fairaudio: Hello Herr Mundorf. 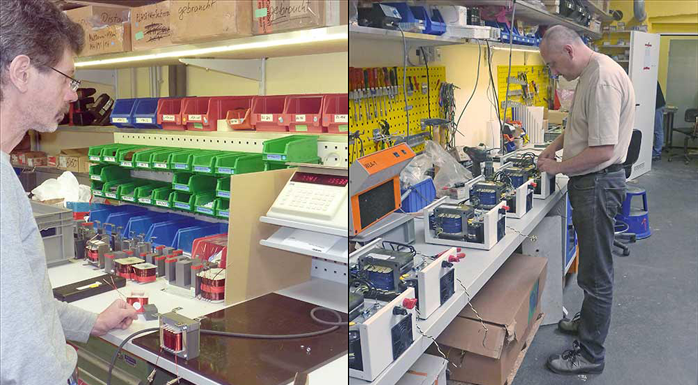 For over 25 years you've manufactured electronic parts. In today's hifi scene your name has nearly become synonymous with top-quality inductors and capacitors. How did all of this start? What was the motivation to go self-employed in this particular sector? Raimund Mundorf: Well, to answer that I must reach back a bit. Both my elder brothers and many of my friends got into DIY speaker building during the 70s. I followed suit and amongst much else built an acoustic lens for an Isophon pressure-chamber driver. I also got deeply involved with Fischertechnik kits and electronics and became very intimate with the stench of semiconductors giving up their ghost (laughs). Then I offered a friend who manually wound his own speaker coils to build him a digitally controlled winding machine if he covered the raw materials. This controller consisted of endless so-called TLL ICs which handled counting, comparing and other logic functions. With all PCBs mounted flat, these ICs took up half a square meter. The mechanics of the first model actually consisted of Fischertechnik kits which merely oversaw the steering control rather than actually wind. But the controller more or less worked as intended. I finished my electro-technical studies with a 3-month hands-on stint in metal work. That must have been around 1984. This gave me opportunity to revisit my winder mechanics but now in steel. The axle was initially powered by a lorry windshield wiper motor which I scrounged from a car demolition yard. The wiring spool ran off a kit motor. All of which positively glows with DIY passion but doesn't necessarily entail going into business. Wouldn't you know it, the hifi world really is small. How come Bankewitz wanted your coils? What was so special about them? I could guarantee tighter tolerances than my competitors and offer any conceivable value which at the time was far from common. Later we added exotic cores and vacuum impregnation. 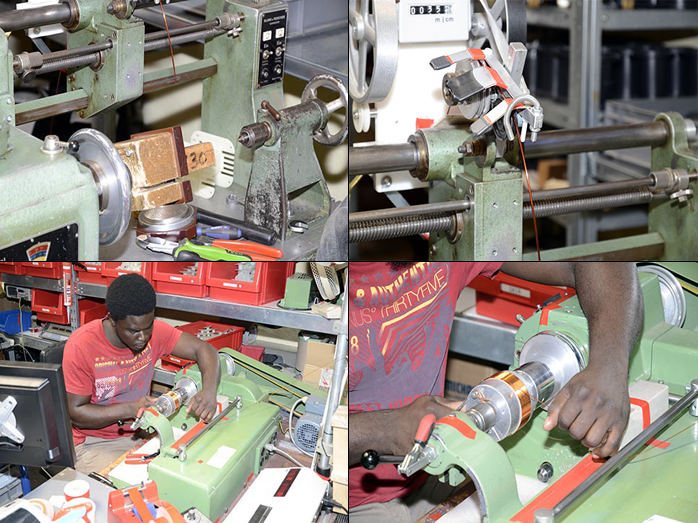 1: The winding machine's spindle | 2: The wire guide of the winding machine | 3 + 4: Junior Nsoa pays for his BWL studies by winding Mundorf coils. To achieve the desired tolerances, coil winding still relies on much exacting hand labor. During the mid 80s your brother Norbert was co-owner of a Cologne hifi boutique. Correct. And that created further motivation for my business. While I still studied I'd jobbed on the side in my brother's shop. I took on things like build a lighting controller for his space. Geschka & Mundorf then was one of the first addresses for quality hifi in this town. Here I grew familiar with many products of my eventual clients and learnt to view demands for extreme quality and service as base essentials. We never conceived of giving any less than our very best. For us that was nearly a code of honor and simply what one did. Never mind, the shop led to a contact with Herr Grube, then importer for ScanSpeak drivers and an opportunity of a display case filled with my products sitting in his showroom. For a straight-to-the-jugular slogan that would really pull I then dubbed a special kind of very low-impedance bass coil the zero-ohm inductor. And (laughs) that term became a real earworm. Some remembered it who knew it to be utter nonsense—in Physics only a super conductor might approach zero inductance—and others because it was exactly what they were after. In either case the zero-ohm inductor became inextricably linked with the Mundorf name also because the just launched DIY magazine Klang & Ton wrote it up shortly after a show. So what's really going on with the 'zero-ohm' coil? For the coil we used the very best metal with the lowest losses and distortion and wound it with very thick wire, then set the gap which determines the induction value by hand. This coil was especially developed for bass filters and offers first-rate impulse response and the lowest possible resistance. Especially for high-efficiency speakers it's a very interesting option. To leave coils behind, what's up with your caps? If we want to stick with chronology, the power supply would come first. This too arose from a Geschka & Mundorf contact. A rep for Nakamichi which then was the uncontested king of tape decks in the shop told us how car-radio shows and point-of-sale demo stacks needed a 12-Volt power supply with very high current output. And those were very expensive. During a chat around the lunch table, Michael Geschka suggested I build one for half the going rate. So car audio... what period was that? Around 1990 is when we had the first PSU. It was the beginning of a wave during whose peak about 80% of all exhibitors in the quickly growing Car & Sound show in Sinsheim demoed with Mundorf power. Our Mundorf supply became a solid installation in the scene and a must-have for any serious dealer. Over time I managed to really drive down the price per ampere of current versus the competition. I also found in the very active Alpine distribution chain a client who became very instrumental in promoting our PSU. It was a real win/win. Everybody knows that no amplifier is better than its power supply. Even now more than 20 years after the fact we still get inquiries for the schematic from clients who just bought a used one. But you no longer build them today, do you? Very rarely. The market completely turned with the ascent of switch-mode power - and not necessarily for sonic reasons. 1: Mirko Filke handles sales & marketing | 2: Holy tin - for minimal losses the choice of core material is vital. | 3: Various quality levels of parts reflect directly in sonic performance which...| 4: ... becomes obvious with a bread-boarded crossover that allows for endless parts swaps. Let's get to your capacitors which after all are what most think about whenever Mundorf is mentioned. When were those added to your portfolio? During the start of the 90s we began to distribute quality caps built to our specs. 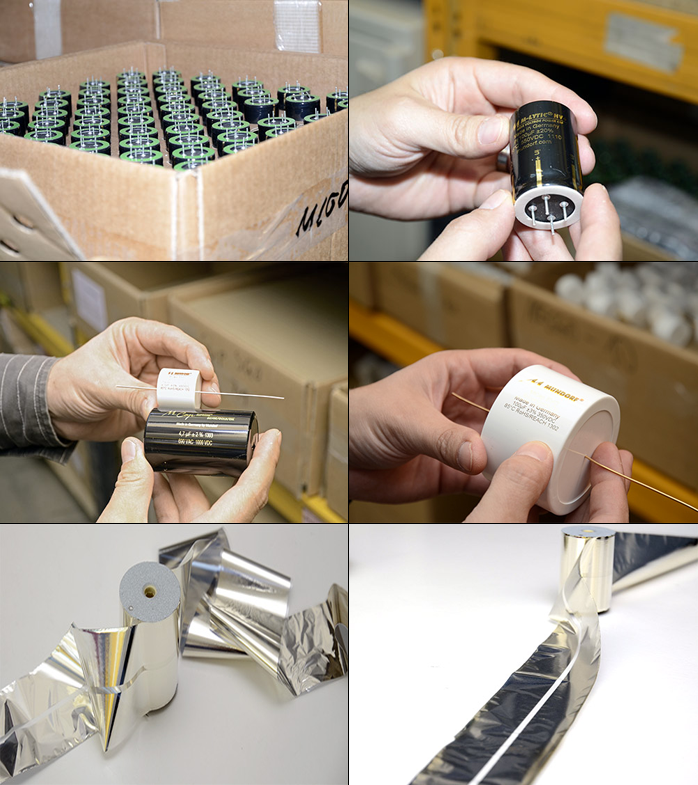 This began with the MCap which over time became synonymous with quality in hifi capacitors. In close collaboration with our German cap maker this was followed by others of consecutively improved specs. Today the MCap Supreme has become what the zero-ohm coil was for us at the beginning – the product most associated with our brand. .. which no longer is Zendo by Mundorf but simply Mundorf. Admittedly the better branding too. What I was really getting at—and which many of our readers won't know—is that you also build drivers. True. 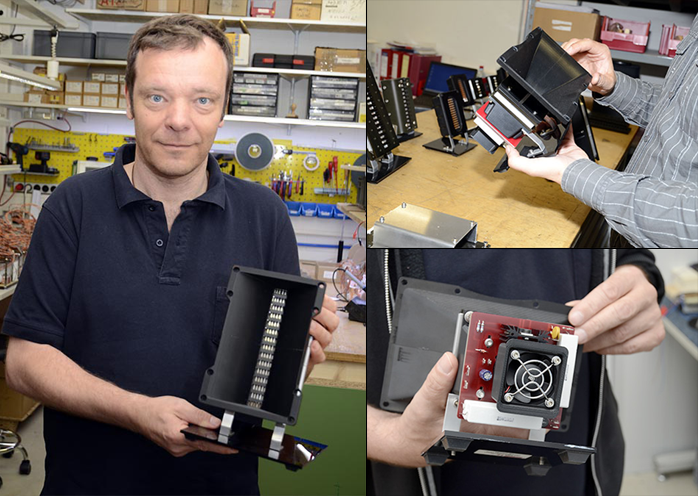 Since 2004 we've been involved in the development and production of tweeters based on the AMT principle of Dr. Oscar Heil. What would lead a cap'n'coil guy to air-motion transformers? That seems a bit of a stretch. We really only meant to distribute AMTs. Another firm was supposed to produce them. It's simply that clients particularly in the pro sector came back with feedback that our drivers were nice and all but still missed certain core requirements, in particular the ability to be crossed in lower and exhibit stage-ready SPL safety. In short we had more homework before we could start selling. That's when our original supplier opted out. They weren't keen on investing 7-figure R&D funds. We however saw great promise in this driver technology and decided to take over the existing development as the basis and keep going. 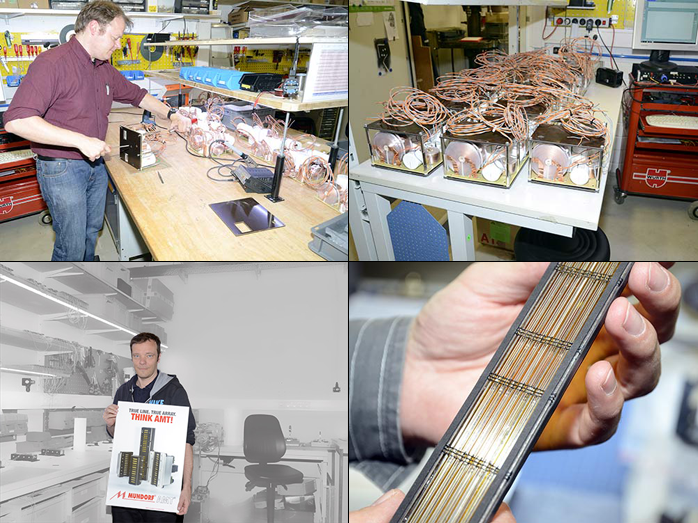 This led to our own in-house membrane production and together with our existing machine shop became the foundation for quite far-reaching R&D endeavors over the past few years. Numerous patents and collaborations with technical high schools can attest to that. Okay, so we covered the most important stepping stones in your company's history – coils, car audio power supplies, caps, finally AMT tweeters. Perhaps now some tech details will be of interest. Your product range after all is quite broad and looking at the capacitor catalogue alone could induce vertigo. Give us a rough overview. Let's start with applications. 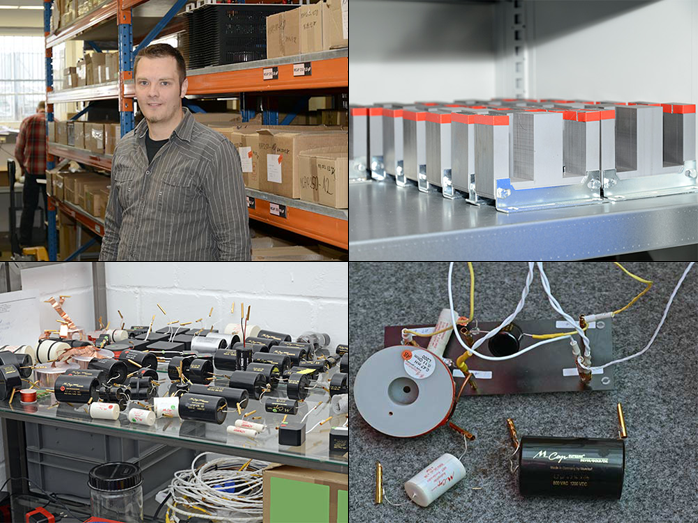 For power supplies particularly of amps we have our MLytic series. Elkos eventually hit their practical limits especially in high-voltage valve amps where our TubeCaps come into the picture. Those withstand high voltages and thanks to their thin metalizing exhibit good self healing. More well-known are probably the types used in general audio circuits and particularly crossovers. There we have three product families: MCap, EVO and MCap Supreme. Obviously those are tiered on price but what distinguishes them technically? The MCaps are made from high-quality polypropylene foil with very tight tolerances. They exhibit a truly fabulous price-to-performance ratio. The EVOs add very low inductance and low internal resistance optimized with our winding geometry. To minimize self resonance they also get potted in oversized cans. The EVOs are easily identified by being relatively narrow but of a rather large diameter. True enough from looking at them – but why? The narrow foil shortens the signal path and resistance. Since a given capacitance value relies on surface area, we have to make up the reduction of width in length, hence the larger diameter. … which has another advantage. Such a winding has more turns, hence a greater cross section which leads to bigger contact area. Each turn can be viewed as its own plate capacitor with a given internal resistance. In the EVO we wire more 'individual plate condensators' in parallel than one would in a conventional broad geometry; and paralleled resistors lower overall resistance. The EVO geometry leads to large contact surface, a short signal path and more comprehensive paralleling of individual caps (windings) all of which minimizes the remaining internal resistance. 1 + 2: Raw SPL are important and Mundorf's Pro AMT delivers. | 3: This can heat up the folded foil sufficiently to necessitate fan cooling. Plausible as far it goes but how come the top MCap Supreme goes wider again if you just said you preferred the narrower build? It only looks that way but it's really no wider. Simplified the Supreme combines two series-connected EVOs stacked one behind the other. That you admittedly don't see from the outside. Why the series connection if you just told me that paralleling is advantageous? Relax. For individual turns it's true that paralleling is beneficial. The more turns you have, the more 'individual caps' you parallel to lower the composite resistance for the same surface area. With the Mcap Surpreme we pursue something else however. The current in turns one and two flows in the opposite direction which also opposes the inductive magnetic field which you can never avoid. And that's what we want. Opposing magnetic fields more or less cancel each other out which minimizes remaining inductance. Whilst actual production winds a Supreme in a single go, the foil layout ends up as two series-connected windings. Put that way it makes perfect sense. To make it more complicated again, the EVO and Mcap Supreme are also distinguished by different conductor materials (laughs). To get serious again, over aluminum the use of silver or our silver/gold alloy for our metalized caps was a very significant step forward. The sonic differences between conductors particularly with our silver/gold mix were so sizeable that we decided to also exploit them in cables. That's how we first conceived of our own cable line. Another sonic advance previously not the norm for foil caps was our oil impregnation which mechanically stabilizes the windings to effectively reduce the vibrations caused when current flows to deform the music signal. Vacuum impregnation creates the same advantages for our filter and foil coils. I reckon the key word there is minimized microphony. Spot on. The music signal generates a magnetic field around the conductors which attract and repeal each other in alternation to induce movement. And a moving conductor inside a magnetic field induces a new electrical signal. The music signal spawns its own echo if you will. Aside from vacuum-impregnated coils you also deal in baked-lacquer types. Could you explain those? 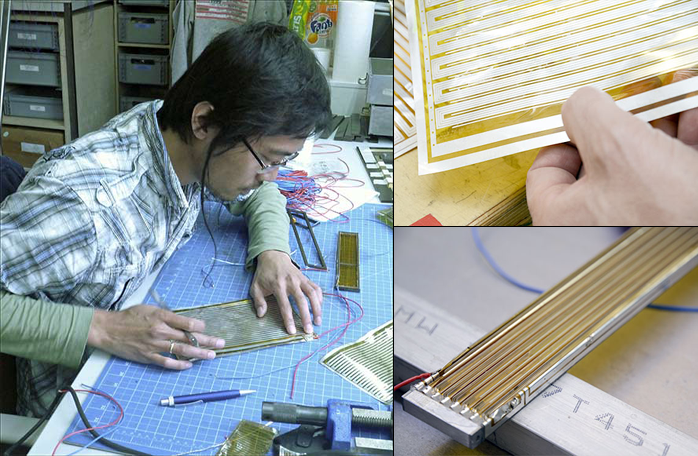 The baked lacquer is a second lacquer layer around the wire's own dielectric lacquer. This second layer melts at around 180°C. We run current through the wound coil, the baked lacquer melts and afterwards dries. This pots individual coil windings into one tightly glued mass. Baked-lacquer wire only exists up to 1.4mm diameter. Anything thicker requires vacuum treatment again where negative pressure migrates the lacquer into the innermost windings. To finish up these coils they go into a dry oven. And how do you finish off your flat ribbon coils? With merely shrink wrap. They don't anything else as they're intrinsically stable mechanically. Ribbon upon ribbon creates large mechanical contact patches. Solid-core turns only meet en pointe. That's akin to stapling flat panels together versus tacking up round broom handles. In practice it means that our ribbon coils enjoy a reduction of vibration and microphony that's an order of magnitude bigger than the normal solid-core equivalents. 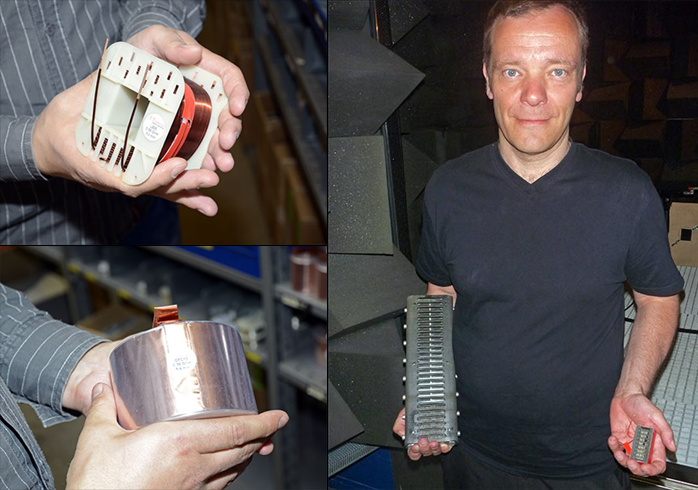 1: Yan Advaita works on an AMT foil which... | 2: ... shows the embedded voice-coil traces in close-up and... | 3: ... looks like this folded and assembled. Aside from choosing between copper, silver or silver/gold alloy windings, a client also gets to decide on core materials, right? Just so but remember that the best core is no core at all i.e. air. Air doesn't suffer hysteresis losses or saturation. Air cores simply get impractically large when ohmic resistance eventually skyrockets with high inductive values. Then one reverts to cores again. We incidentally fabricate our own cores rather than procure them. The respective material for our various cores is graded by low magnetic losses and high saturation resistance. Hysteresis, saturation – can you get more specific? Hysteresis refers to a certain magnetic 'memory' or trace when the external magnetic field goes away. To reset the charge to zero requires an opposing magnetic field which has to perform some work to 'switch' the elemental magnetic particles in the opposite direction. Obviously that's a deviation from linearity and as such a distortion. In practice that's most noticeable during quiet passages where the relationship between hysteresis losses and signal strength handicaps the latter. That's because the constant hysteresis value isn't obscured or covered up by the diminishing music signal. Saturation is the opposite. It occurs at high levels. The core saturates when it gets completely magnetized. The magnetic flux density no longer tracks the rising signal proportionately. In a crossover this leads to trouble and in extreme cases to midrange signal bleeding through the woofer – not what the designer intended. What's in the near future for Mundorf – a further development of the AMT business? Just so. By now we offer AMTs of nearly all sizes starting with extremely compact sorts for the car industry to an entire range for hifi applications to special versions for stage use where extreme SPL at very low distortion are key. Our Pro AMTs now perform at such a high level that broad-scale employment in sound reinforcement has become possible and hopefully will lead to a real step up in quality for that sector. What must come next for us after our extensive research and development phase is the further industrialization of the actual production process of these advanced drivers. Many thanks for our talk.